Welcome to Tampa's Premier indoor shooting range. Shooting Sports has combined the best features found in other indoor ranges in the country to develop the Tampa facility. Shooters may use their own firearms or rent ours. All firearms, when not at a shooting station in the range, must be in a case and unloaded. Our safety policy requires that a minimum of two shooters be present to rent one of our firearms. We require eye and ear protection. You may use your own or rent those from us. Eyeglasses are ususally sufficient eye protection. We do not allow steel core, steel shot, slugs or black powder. You may bring your own ammo but it must be Full Metal Jacket. Children must be at least 10 years old to shoot on the range. Children under the age of 18 must be accompanied by a parent or guardian. $12.00/person, pistol. Per visit. No time limit. $7.75 for children under 13 years old. $15.00 for rifle range, per half-hour (Depending on Demand) Ask about details. $15.00 for shotgun. Per visit. No time limit. Firearm rental: Cost of renting a firearm will depend upon the type and caliber of firearm chosen. Rented firearms must use our ammo. Hearing/eye protection: $1.75 earmuffs, $1.50 safety glasses. Targets: A variety available. For sale in packets at prices from $1.25 to $3.50. Remember, shooters with memberships pay no range fees. Ever. To save time, read our Range Rules before you come in. The professionals at Shooting Sports recognize the growing demand for responsible firearms training and meet this demand with formal classroom training for the novice, intermediate, and advanced student. All Shooting Sports Instructors are NRA and/or USCCA Certified. Talk to us about your needs. We have been adding specialty courses for advanced shooting programs and self-defense classes for those shooters seeking challenging competition. This course is designed for the student that intends to obtain a State of Florida Concealed Weapon or Firearms License. This is an advanced course and is not recommended for inexperienced shooters. This course exceeds the requirements set forth by the State of Florida as proof of proficiency with a firearm. You do not have to own a handgun to take this class; the price includes the use of a rental firearm, safety equipment, and targets. The student will be responsible for ammunition used during the class. If you do own a handgun, you are encouraged to bring it to class and receive this training with your own firearm. On the range, you will be required to shoot 25-50 rounds at distances of 3, 5, and 7 yards.. Proficiency Certificates are awarded after successful completion of the class. The course is three hours long. 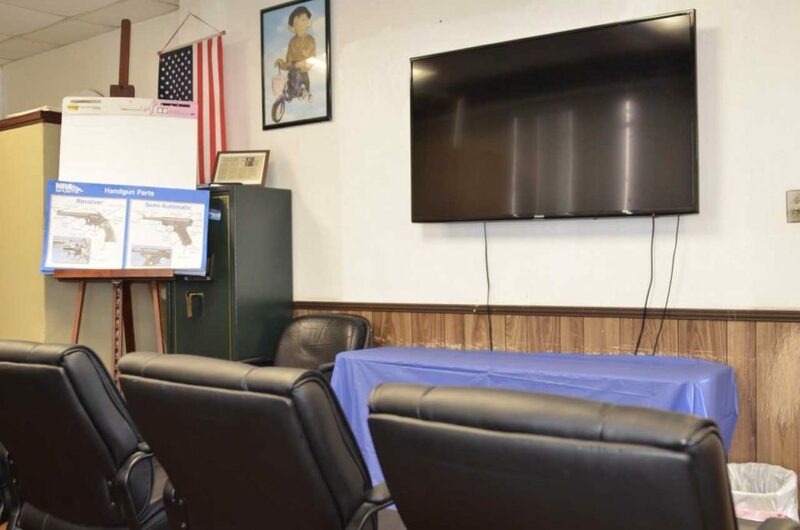 The concealed weapon license class fee is $59.99 for one person, $115.00 for two, and $55/person for three or more attending at the same time. Payment is due at the time of registration. If necessary to reschedule, we need to have notice 72 hours or more before the class scheduled time. A class can be rescheduled once after the initial class scheduling with no penalties. Any additional rescheduling will be subject to a $10.00 fee. Any refunds are subject to a 15% restocking fee. Scheduled students that do not show or call are not eligible for a refund only rescheduling. The USCCA Beginner’s course is for the individuals or families new to firearms. It is a hands-on introduction to safe gun handling. The curriculum includes shooting fundamentals, the safe operation of firearms, ammunition type and range qualification. This course meets the training requirements of the state of Florida for the “Concealed Weapon or Firearm License. Students must purchase store ammunition for rental guns. Students may provide their own firearm, if appropriate for the class. Inquire at counter for class schedule dates. Visit our newly-redesigned store for more new guns, more consignment, more accessories. Reloaders: We're selling cleaned brass now! Talk to us about your needs. NOTE: All caliber ammo is available! In addition to the range facilities, Shooting Sports has a complete line of firearms and accessories. These items include a full selection of handguns, rifles, shotguns, ammunition, and shooting accessories. A complete line of rental firearms are available, giving you a chance to try out a number of firearms so you can make an informed decision before making the purchase of your firearms. The retail area also features a viewing area in a comfortable atmosphere for socializing and relaxation. Relax and watch the shooters on the range. Shipping and Receiving of firearms: We accept transfer shipments of firearms from other licensed FFL dealers for a nominal Transfer Fee. Consignment Sales: You can always get more for your firearms if you sell them on consignment. We offer this service at 15% of the selling price. We also purchase guns outright.